Written especially for legal professionals, this newly revised and expanded edition is a complete, hands-on guide to the best sites, secrets, and shortcuts for conducting efficient research on the Web. Learn the differences between legal research and fact-finding. Discover the distinction between the "visible" and "invisible" Web and how to find information in each. Learn the nuances of search engines in order to formulate strategies for locating the information you need. And read real-world war stories of how Internet data has benefited other legal professionals. 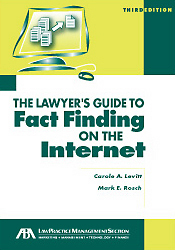 "The Lawyer's Guide to Fact Finding on the Internet"
This may be the most user-friendly Internet research book available for legal professionals today! Search Engines: Last Resort or First Resort? Look for the Free Sites! Isn't the Most Current Information Better? Why Use Blogs for Research? What's in a Public Record? What's Your Political Persuasion (and Where Do You Work)? Which Courts Have Placed Dockets on the Internet? Where Do Pay Databases Get Their Data? Why Use the Internet for CI Research? Where Does CI Information Come From? Click here for information regarding purchasing this book.